As I wrote before, irregular verbs are the most important thing for all students of English to learn. However, it is not easy to master them. That is why Fluency and I started to collaborate on a series of posts that deal with teaching just the irregular verbs. In this post we are going to introduce another set of 15 verbs. To learn them there is a song, an infographic, a quiz and a game. If you go through all the activities you will meet each word at least 6 times. We hope you will like our work and share the post. Listen to the following song and try to complete the lyrics. To complete the lyrics start the song at 2:05. Here is the infographic with all the irregular verbs, you should learn in this post. For each word there is a definition (in either word or picture form) and two examples of usage. Display the infographic and go through the verbs with your students. Explain the meaning of the difficult words. Now it is time to practise the irregular verbs. The first game is called Penalty Shootout. In this game you should choose the correct past tense and past participle of each verb and then try to score a goal. Good luck. The second activity is a two-part online quiz. Your task is to choose the correct answers and pass the quiz. You you will be rewarded with a game after each part of the quiz if you pass. This game is in HTML5, so it will play on all mobile devices as well as desktop computers. 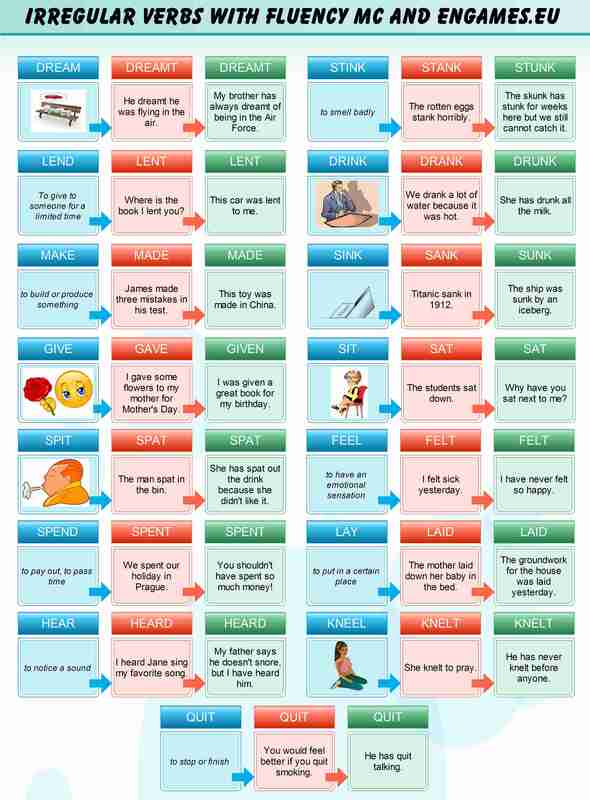 Irregular verbs by British Council.